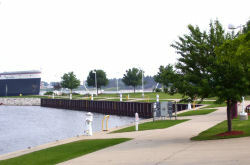 This park is located between the City Marina and the Harbor View Marina at the south end of William Street. Note that the section of park which is west of William St on Filer (just south of the City Marina) is only partially for public use. Rest rooms, fish cleaning stations, some picnic areas, most parking, etc. is reserved for those who have paid for slips in the City Marina and their guests. Hiking- Follow the link for a description of the Ludington Waterfront Walkway, two loops of which go through the park. Picnicking- two pavilions- the one just west of William Street has wind screens on the lake side, the large one with restrooms is on the northeast side, picnic tables and grills. There are canopies with fixed picnic tables and no grills along the southwest edge of the park. Hooked on Hamlin - Created by Stanley Proctor of Talahassee, Florida. "A father may teach his son to fish, but a grandfather teaches him to fish for his dreams - Chinese Proverb. The many friends of Hamlin Lake dedicate this sculpture to the bond that links generations of families with the natural wonders of our Great Lakes Ecosystem. Wild and natural things make up our irreplaceable and fragile Hamlin Lake, and we pledge our commitment to the dream of sustainability for the lake we love. 2009." Put Me In, Coach - Created by Mark Lundeen of Loveland, Colorado. "For seven intermittent seasons between 1912 and 1926, the Ludington Mariners played baseball in Culver Park, once located near this site at the southwest corner of Loomis and Lewis Streets. Typical of minor league professional teams of the time, the Mariners were independent and unaffiliated with any major league team. Five Mariners went on the play in the big leagues. Donated by Bill and Anna Anderson and Budde and Sheryl Reed. April 2004"
The Dummy Train - Created by George Lundeen of Loveland, Colorado. "This sculpture was presented to the city of Ludington by the cottagers at Epworth Heights in gratitude for the generations of our families who have enjoyed their summers in this beautiful environment. The first train rolled over the track to Ludington from Flint in late 1874. The railroad played an integral part in connecting the newly established city of Ludington to the outside world and was key to the growth of bothe the logging industry and tourism in Ludinton. The Epworth League Railroad was incorporated in 1893, and thus service from Ludington to Epworth was established. The passenger train, which was known as the Dummy Train, carried thousands of summer residents to Epworth Heights, a Lake Michigan beachfront community. Often husbands sent their wives and children ahead of them to escape the summer heat. They joined their families intermittently during the season as their business schedules permitted. Remnants of the original rails used in Ludington are present with this sculpture. The advent of the automobile diminished passenger travel, and in July 1919, the last passenger fun was made. 2005"
Follow the Leader - Created by W. Stanley Proctor, Talahassee, Florida. "This sculpture was donated by the Don Birtwistle family to celebrate children who are our future. 2002"
Ludington's Lumbering Era - Created by Ron Dewey, Cleveland, Ohio "This sculpture was donated by Herb and Arlene Chinworth to depict the historic role lumbering played in the development of the city of Ludington. 2004"
The Spirit of Ludington - Created by Kirsten Kokkin "Dedicated to the memory of Charles Conrad, "The Spirit of Ludington" honors all seafarers. These brave men and women pledged their lives to the fine tradition of working on the Great Lakes. Pioneers in their trade, they courageously faced the hardships of living at sea. While performing daily duties, they unknowingly helped to settle and build commerce in the community, as well as extend travel to this region of Michigan. Courtesy of the Conrad Family. 2001"
Reflections - Created by Irina Koukhanova, Cleveland, Ohio. "This sculpture was donated by the Lee and Joan Schoenherr. "Reflections" is a symbol of Ludington's past when schooners carried lumber from our city to other Great Lakes ports; it is a symbol of the present representing the pleasures of boating on our waters; and it is a symbol of the future as the winds of change move Ludington forward. 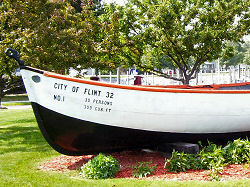 2006"
Lifeboat from the ship "City of Flint" - located at the west end of Filer St, south of the City Marina. Boating and Baseball - There is a sign at the entrance to the park about the Mariners minor league baseball team. Ludington's Lumbering Era - The entire back of the sculpture of this same name is engraved with text and pictures on this topic. 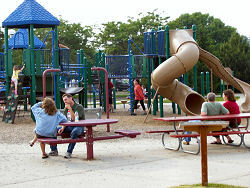 The walkways and the picnic areas located along the walkways are paved and accessible. Access- south end of paved William Street, Ludington. not quite enough public parking, street parking ok.
Take US 10 west into Ludington. This becomes Ludington Avenue. Continue west through downtown to William Street. Turn south (left). Go two blocks and enter the park.